Imagine all your childhood images of a giant squid. A huge dangling beast with monstrous tentacles, crushing submarines and glaring at you with an eye the size of a beach ball. Captain Nemo battling one of the creatures in 20,000 Leagues Under the Sea, vikings combating the mythical Kraken attempting to pull their wayward ship below the waves, or one entrenched in a life or death battle with an enormous Sperm Whale ready to make a snack out of one of its appendages. Pretty epic memories, huh? Or did I just fantasize to much about under sea creatures when I was a child? Now, think to yourself, when was the last time you actually saw one in motion? When have you ever seen a giant squid swimming through the great blue ocean or actually battling one of its iconic ocean enemies? The truth is you haven’t because humans have never actually filmed a giant squid in its natural habitat. That is, of course, until now. Japanese scientists, working in tandem with NHK Broadcasting and The Discovery Channel, have finally managed to capture a giant squid on camera. Using an NHK developed HD camera specifically for the task of filming in the pitch black ocean depths, brand new bio-luminescent bulbs designed to replicate the light emitted from deep sea jellyfish, and some good old fashioned bait and fishing line, several scientists were able to film the beast from their tiny submarine. 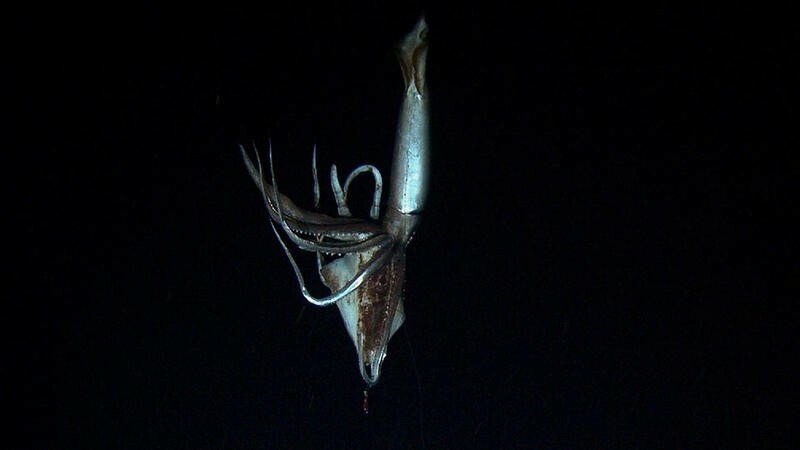 The squid was filmed last July roughly 620 miles south of Tokyo near the Ogasawara archipelago at a depth of 2,066 feet below sea level. The submarine pursued it to 2,952 feet before it vanished into the darkness. At this depth, the water pressure is immense and can crush objects not used to the stress. The scientists had conducted over 100 missions spanning more than 400 hours to get the footage, and they were more than pleased with the results. Museum researcher Tsunemi Kubodera was one of the scientists aboard the mission, and he is looking forward to future tests and endeavors. The squid in the film is over nine feet long, but the scientists are reporting it is missing two of its largest tentacles which could have put it up to 26 feet long had they been intact. In the footage, the squid takes the smaller squid used as bait and eats it for twenty minutes before swimming away. While waiting, the scientists sat and waited in the dark, their lights completely shut off to avoid startling the light-sensitive creature. Kubodera has studied the giant squid for more than a decade, and he admits a certain amount of pride in being on the expedition that finally uncovered the rare creature. Prior to this sighting, the only other successful filming of a giant squid was taken in 2006 at roughly the same coordinates. Scientists were able to hook a giant squid and pull it up to the surface, successfully filming it, but not in its natural habitat. The giant squid “Architeuthis” is apparently regarded as one of the last great mysteries of the ocean since their habitat is fatal to humans and not so readily explorable. Others hope the technology used to film the beast will be put to use filming other mysterious creatures from the deep humans have long fantasized about. The footage is currently property of NHK and The Discovery Channel. What you see above is a sample of it. The Discovery Channel will air the full footage in a documentary on January 27th. NHK also plans to release the footage at roughly the same time this month.